The Tory Party, of course, remains to its true self: efficient to the point of brutality. The murmurs of dissent already mould the atmosphere. The heirs of Edmund Burke have somehow forgotten the virtues of gallantry and chivalry. Some of them are openly whispering their plans to commit matricide and ditch the lady upon whose coattails they had hitherto enjoyed their immense popularity. Some eminent right-wing commentators – from Tim Montgomerie and Iain Martin to Fraser Nelson and Simon Heffer – seem to have lost all sense of proportion. Lamenting the supposed decline of conservatism, they have utterly ignored that the Tories have been, ever since 2005, increasing their share of the vote on an almost linear scale. Michael Howard, in 2005, gained 32.4% of the national vote for the Tories. From then onwards, the electoral figures speak for themselves: 36.1% (2010) ⟶ 36.8 (2015) ⟶ 42.2% (2017). It is clear that the Tories increased their vote most under Mrs May, not her immediate predecessor. David Cameron increased the Tory vote by 3.7% in 2010, then barely 0.7% further in 2015. Mrs May, however, increased the Tory vote by 6%. Her share of the vote is exactly that of Mrs Thatcher in 1987, and only 0.2% lower than Thatcher’s 1983 landslide. 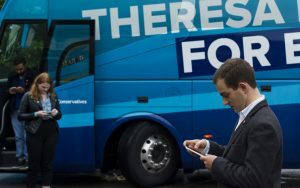 Ironically the Tories – staunch defenders of the first-past-the-post system – struggle not in gaining votes, but rather in translating their popular vote into parliamentary seats. Most of the commentariat currently herds around a belief that Mrs May’s strength is unrecoverable. Political commentariat is distinguished by clichés. Seldom can the commentariat think of an historical analogy beyond a past generation or two. According to some, she is another Edward Heath, to others she is another Gordon Brown. Such utter nonsense only proves that journalists should refrain from playing the game of ‘Applied History’. For the two most pertinent historical analogies applicable to our current predicament leads us much further back to two Tory icons: Benjamin Disraeli and Stanley Baldwin. 1) Disraeli – much to the chagrin of the Tory Right – extended the franchise in 1867. He had presumed that his party will be rewarded. His gamble backfired most brutally: far from gaining, the Tories actually lost 18 seats. The likes of Lord Salisbury lurched upon him. Yet the Tories did not ditch him. They stuck to him. Disraeli reorganised the party by creating the Conservative Central Office in 1871. He later led the Tories to a splendid victory in February 1874. The same Salisbury, who had once been his sworn enemy, joined his Cabinet. These two very different Tories forged an alliance, and they led their nation to even greater glories thereafter. It is incumbent upon the likes of Boris Johnson and David Davis to support Theresa May – just as Salisbury and Northcote supported Disraeli. In December 1868 Disraeli was seen to be nothing less than a ‘dead man walking’. By 1878, however, Disraeli returned from the Congress of Berlin with a diplomatic triumph. All Bismarck could say was: ‘Der alte Jude, das ist der Mann [The old Jew, he is the man]’. 2) In the summer of 1929 it was supposed that Stanley Baldwin would at least retain, if not increase, his majority. He ran an innocuous campaign based upon as tedious slogans as ‘Safety First’ and ‘Trust Baldwin’. To the astonishment of all, the result was calamitous for Baldwin: the nation elected a hung Parliament as he lost 152 seats. The man who once seemed invincible was declared ‘finished’. The press was determined to oust him. Yet Tory backbenchers, yet again after breathing lava, kept their cool. They reorganised the party, and ensured that its policies would be comprehensible to the populace in the next election. So, barely two years later in October 1931, Baldwin led the Tory Party – or to be more precise, the National Government – to a victory unlike any other by bringing about the biggest political turnaround in British electoral history. He went from 260 seats to 410. History gives solace, not solutions. Perhaps the Tory anger against Mrs May is more to do with expectations than the result. Mrs May’s mismanagement of the expectations was indeed even worse her campaign: at the beginning it seemed that she was heading for a landslide on the scale of Baldwin’s 1931 victory; as weeks went on, people were expecting a parliamentary victory on the scale of Salisbury in 1886 or Thatcher in 1987; in the end, as Tories now know only too painfully, even Cameron’s insignificant majority was snatched from them. One clear lesson the Tories must accept is that they must reorganise the party: just as Disraeli did after 1868, and Baldwin after 1929. Yet, ignoring the psephological and historical facts above, the political commentariat indolently salivates over political machinations. Tory backbenchers should remember that it would not be efficient to betray the Prime Minister during the Brexit negotiations. It would tantamount to treason. It would be untrue to the most fundamental principle of Toryism: allegiance to the nation. If such an insidious treason is committed, then the betrayers must make it happen in couple of days – not weeks, not months, not years – but now. That, however, is impossible. Few of these traitorous backbenchers may spit oceans in anger, but they well know that Mrs May – unless she chooses of her own volition – cannot be removed within days or weeks. In coming weeks, as she will be embroiled in the minutiae of Brexit negotiations, her removal will be difficult still. And how foolish it would seem to be rid of the Queen’s first minister in the midst of negotiations. It is true that Mrs May, in spite of the popular vote, has failed to achieve even a slim majority, let alone an expected landslide. It is also true that this was due her lacklustre campaign. But the election is over: the result is what it is. Theresa May is still Prime Minister, still with most number of votes and most number of seats. Theresa May can only rectify her electoral ‘failure’ with a national success. She must be given a chance to fight for Britain. Her stubbornness, which was been her shortcoming in a campaign, may well be her strength on the negotiating table. She maybe robotic, but robots are not made of feathers. Surely, then, she must be allowed to implement her Brexit plans, the principles of her own Lancaster House speech. 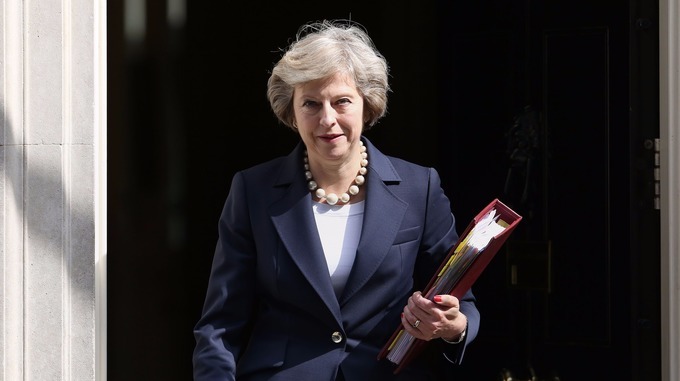 In domestic policy she has already been forced to reform and consult a wider circle; in foreign policy – and most importantly on Brexit, for much depends upon it – she must be allowed to forge ahead unimpeded. The vision of Mrs May’s Lancaster House speech is truly historical. If implemented sensibly and successfully, it would certainly resuscitate Britain’s global status. The Tories are disappointed, not desperate. Mrs May is humiliated, not hopeless. She may no longer be that invincible – almost untouchable – goddess that she seemed before, but millions across Britain genuinely respect her profound patriotism and sense of duty. Her popular vote is higher than that of any Tory since Thatcher. I daresay that she will recover her steel if she shames the opposition in coming weeks in the Commons as she has done for months past. If she makes Britain proud in Brexit negotiations and if she makes Britain a global trading nation once more, then she will recover handsomely. (Though it cannot be denied that she is in need of a good P.R.-team.) Tories will be duly rewarded electorally; and Mrs May will be accorded an eminent place in the pages of history. Not even 365 days have fully passed since most Tories were looking to her as a deliverer, a saviour. She may prove to be the saviour still. To ditch her, in a spasm of remorse, would be cowardly and contrary to the national interest. Political wounds can be healed with national success. Great leaders reveal their greatness in times of crises. Only events would now show whether she would be the Great Survivor of our times. The Tories, for their part, must never forget that there can be no certainty without continuity. S.K. Khanna is a young independent writer. He is currently working on 'The Origins of Brexit', a geostrategic history of Britain.